I-Ssp6803I is a homing endocuclease from Synechocystis sp. pcc 6803 which catalyzes the insertion of group I intron into bacterial genome . We found out that this enzyme, unlike any other previously know homing endonuclease, shares a common fold three-dimensional fold with PD-(D/E)XK nucleases. This finding could bring new insight into our understanding of functional and evolutionary relationship between restriction systems, DNA repair systems and mobile elements. To confirm our prediction we decided to build a three-dimensional homology model of I-Ssp6803I using the Holliday junction resolvase (1gef) as template. Shortly after our model , a crystal structure was published . Our fold assignment was correct and the RMSD between model and native structure is ~3.7 A. We also correctly predicted all the catalytic residues. However, we failed to predict the quaternary structure as it turned out that I-Ssp6803I is a tetramer and not a dimer. 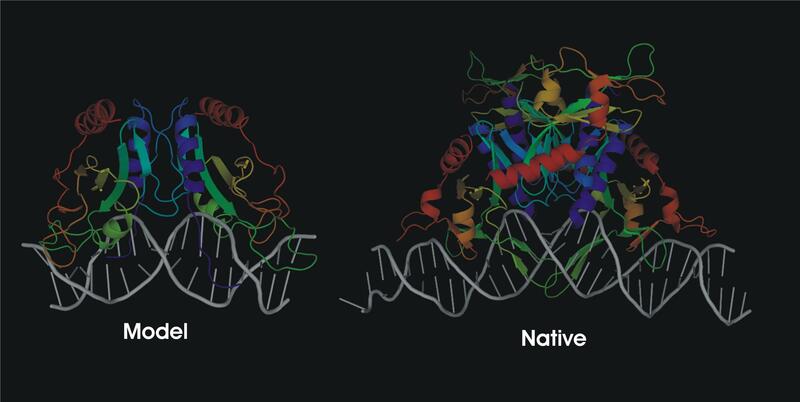 Comparison of structures of our model and the native structure (PDB code:2ost). Structures are colored according to the sequence index (N-terminus – blue, C-terminus – red). We correctly predicted that I-Ssp6603I exhibits the PD-(D/E)XK fold The model has very good quality in the catalytic region. However, the DNA binding mode and the quaternary structure were not modeled correctly.